A few months ago, I sent Jill some Inchie Arts products from my stash to play with. For the next three days, we'll both be sharing Inchie Arts projects with you! 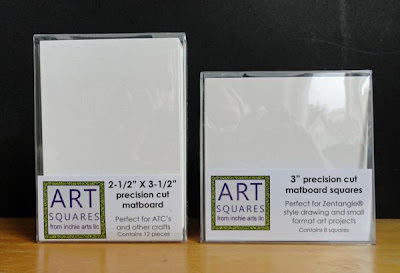 These little matboard squares are so versatile and fun to work with - such perfect little canvases for artwork and a variety of coloring media. The squares currently come in 4 different sizes and 7 different colors. There are new ATC-sized pieces too!! You can learn all about them on the Inchie Arts website! Here are the 7 colors and original sizes - 2-inch Twinchies, 1-1/2" Inchie Plus Squares, and 1" Inchies. Brand new products: ATC size matboard pieces, and 3" squares. Can't wait to play with these!! What a great size for altered projects, card and book fronts, etc. Today we're both working with Twinchies, which are the 2-inch matboard squares. I created two similar cards, using the same layout but different color schemes. All the stamps and dies I used are from my own stamp line at Impression Obsession, dkdesigns. I'll link all the products below. I stamped the dressform image first, then masked it with a post-it note to add the other collage elements. I then laid a Crafter's Workshop stencil over my square, and filled in the Harlequin pattern using an oil-based pencil (wax-based pencils work too). My next step was to watercolor the square. The pencil resists the watercolor paints just enough that the pattern shows through. Love this little technique! I used Shinhan Premium Watercolors. Here's a close-up of the horizontal panel - it's made up of narrow scraps on a strip of double sided tape. I embossed the strip before I added the die-cut borders. Wow Dina! You sure know how to fill two inches of space with maximum, overflowing beauty!! Lovely designs and technique. Dina! I LOVE both of your creations! Such awesome techniques!! Stunning, I know inch art is one of the hardest to produce, art in such a tiny area.Of course your turned out amazing, thanks again for sharing..
Just adorable! So much detail in such a tiny area! Lovely!! Just beautifully done Dina. That Twinchies board looks great to use.